A study in contrasts: one extravagent and ostentatious, the other small and simple. Farallon and Ryowa Ramen. 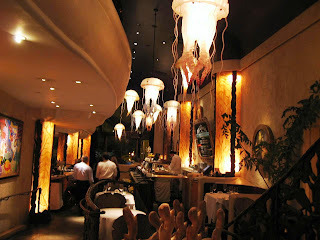 Farallon, located within a block of Union Square in San Francisco is an unique restaurant that recreates an opulent undersea environment with jelly fish lamps and coral reef walls. 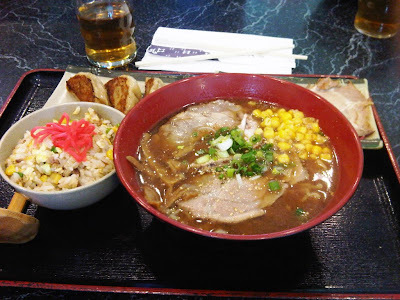 In complete contrast, Ryowa Ramen brings the small noodle restaurants of Tokyo into the heart of Silicon Valley. A three-sided bar and a few tables with a television showing one of those kawaii Japanese talk/game shows completes the decor. 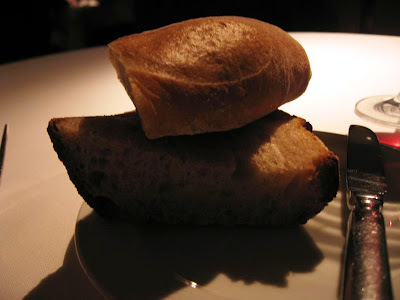 First, my visit to Farallon. The interiors are very much the highlight of this restaurant, especially the bar area. I nibbled on my bread and sipped a Pinot Noir as I looked around. The restaurant was crowded on this evening as was the bar. 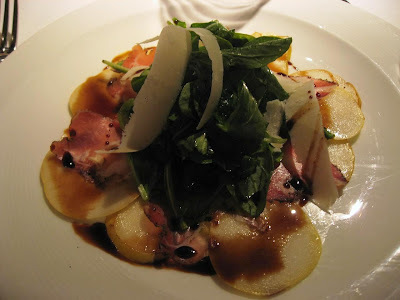 The baby Arugula salad with aged balsamic on a carpaccio of French butter pear and sweet coppa - thin slices of Italian pork shoulder - was absolutely fantastic. I had been a little worried seeing the mixed reviews when I was planning to visit this restaurant, but this was a promising start! My entree was the Hawaiian Ahi-tuna. 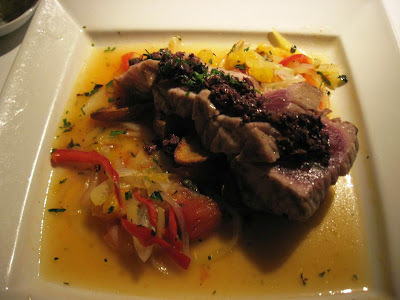 Grilled rare, the tuna was served on a bed of roasted French fingerling potatoes, gypsy pepper piperade and Niçoise olive tapenade: the latter two being exotic European sandwich spreads made of pepper and olive respectively. This dish seemed huge but I was able to polish it off. 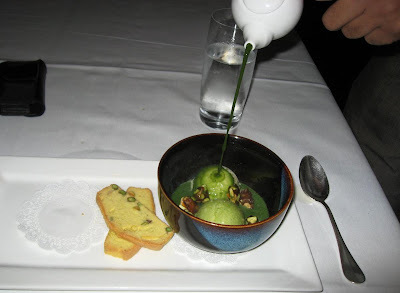 While I liked the interesting play of flavors and textures on the palate, I would not rate this dish as extraordinary. 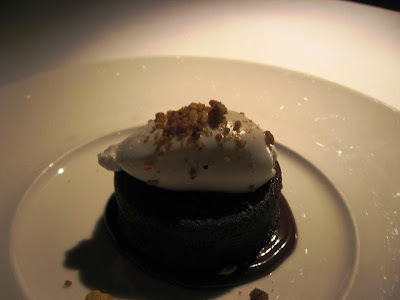 The bittersweet chocolate custard cake was served with Gianduja sauce, vanilla bean chantilly and hazelnut crunch. The Gianduja is an Italian chocolate that is flavored with hazelnuts. Again, the dessert was good but short of amazing. Net-net, there were some hits, some misses, but I will remember Farallon as much for the food as for its unique ambiance. Now, to Ryowa Ramen. A colleague (thanks Joe!) took me to this little place in Mountian View for lunch. 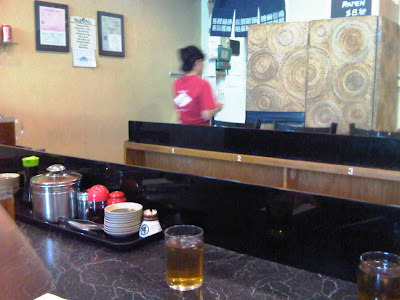 With few seats, Ryowa fills up quickly; however, we were early and found seats at the bar. The lunch consisted of a large bowl of ramen noodle soup garnished liberally with Japanese bbq pork. I ordered an extra serving of pork. The dish came with pot-stickers and fried rice. I chose the Shoyu broth which was very flavorful as was the pork. The lunch turned out to be absolutely great: completely authentic, hot and delicious and completely filling! The pot-stickers were so-so, but overall this was a good meal. I woke up late on Saturday and walked down to a diner close-by for brunch. Mel's Drive-In is a recreation of the popular restaurant chain from the 50s. Retro neon lighting, quaint juke boxes and super-busy staff behind the bar dispensing fried eggs, toast, orange juice and coffee. Quite a charming place to begin a lazy weekend. As I walked back to my hotel, I began noticing something strange: girls and guys in costume. Wondering what was going, I walked along with them and came across a large parade in Market Street. 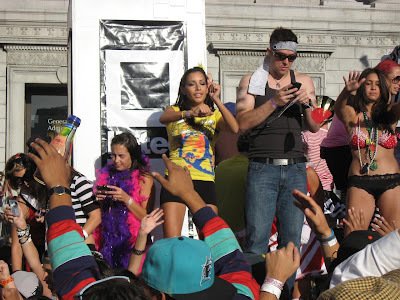 Floats blared out dance music and hordes of young girls and guys in costumes swayed and danced to the music. Others just lined the streets as the parade made its way slowly towards the City Square. 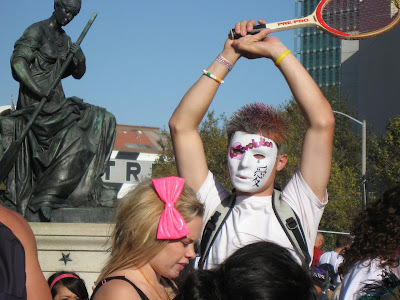 LovEvolution is a dance music parade and festival organized every year. The parade starts from 2nd & Market Street in downtown San Francisco with about 25 floats heading west down Market Street. The floats arrive at Civic Center plaza where they park to becomes 25 stages on transformed festival grounds with food, beverage, a live electronic and performance stage, and outstanding revelry. With 25 different DJs belting out electronic dance music and about 100,000 people filling the city center, it was one big party through the day! It was a windy evening and clearly alcohol was helping keep the under-dressed partygoers warm; there were some completely stoned and drunk as can be expected. However, the mood overall was cheerful and full of fun and the after-parties continued late into the night. I strolled out much earlier and decided to get some dinner on my way back. 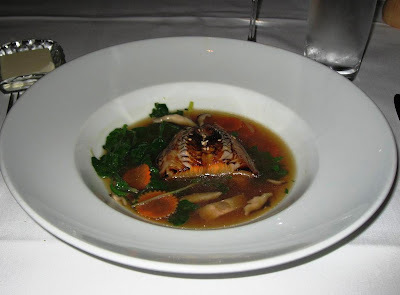 I went into Ame at the St.Regis, a place I have dined before. The sake, Miyasaka Yamahai, was dry and earthy and warmed me up as I waited for my starters. The Trio of Sashmi was a great start. 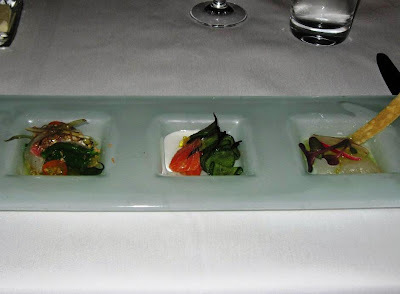 The crudo of halibut with horseradish, the salmon with a thin slice of of cucumber and tartar sauce, the red snapper with string beans were a study in contrasting tastes and textures. 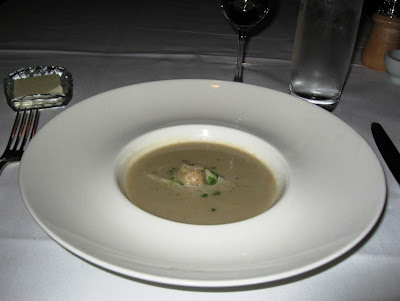 The cream of Sunchoke soup with foie gras tortellini had promise but was ruined by excessive saltiness. The broiled sake marinated Cod in Shisho broth was heart-warming and as good as I remembered. 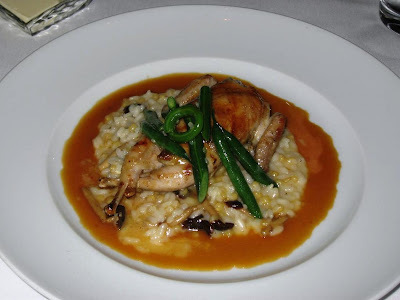 The grilled quail on risotto was wonderfully tasty with a hint of gaminess; it was a whee bit difficult to dig in with a regular sized steak knife - one of those times when I would have loved to dig in with my bare hands! The wheat berries, pioppini mushrooms and foie gras sauce enhanced the taste considerably. 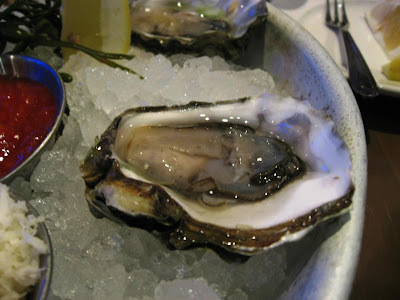 No seafood quite captures the essence of the sea like the oyster. Unlike previous times, I was determined to be a purist and enjoy them raw on the half-shell. 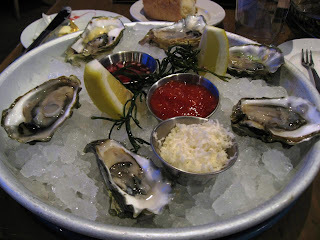 I was at Bradley Ogden's fresh seafood restaurant, Yankee Pier on Santana Row. Like a wine-menu, the oyster menu can be daunting for first-timers. However, the extremely friendly and helpful waitress explained some of the basics quickly. I chose half a dozen of the Hama Hama Pacific Blue oysters, specified as not too sweet and not too briny. The shells were larger than I had expected and it was great fun slurping down the raw oyster with the briny seawater and slowing figuring out its very complex taste. They had provided a couple of dips and finely shredded horseradish along the oysters. 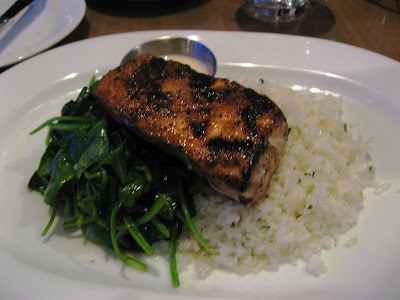 After that, I settled for the Alaskan King Salmon, grilled medium-rare with the middle still very pink and on a bed of sauteed spinach and jasmine rice. Excellent combination: the flavor of the salmon and the fragrant rice complimenting each other. 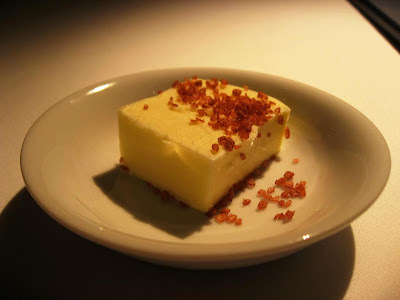 The dessert was a butterscotch custard with a dollop of whipped cream on top. Decadent and completely delightful! 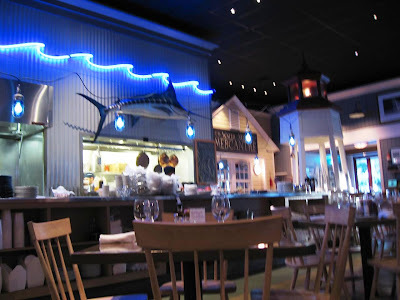 This restaurant is always dependable for an evening of excellent seafood. They also have lot of seating space both indoors and outdoors. The weather throughout this visit has been extremely fickle. While I enjoyed some unusually warmth during the weekend in downtown San Francisco, the temperature dropped precipitously the very next day. But I did get a chance to try some interesting stuff - keep watching this space! BTW, my previous visit to Yankee Pier is posted here. Kolkata has been home to some of our country's earliest immigrants from China. During childhood days, I remember stories of the most exceptional handcrafted shoes in Kolkata's China Town - the only Indian city to have one. And later in life, I would be constantly directed to the Tangra area in China Town for the best Chinese food in that city. Some interesting blog posts on those Chinese who have remained behind can be found here and here. Sadly, what remains now is a dilapidated area inhabited by a decreasing number of the older generation. 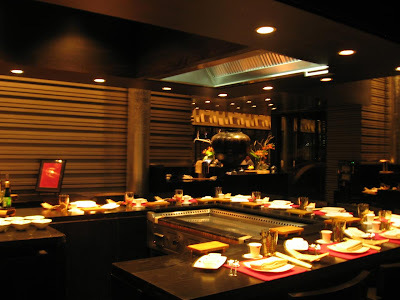 Pan Asian continues this heritage by bringing its eclectic mix of Chinese, Japanese, Mongol and Korean cuisine under one roof at the ITC Sonar in Kolkata. Interactive kitchens with seating around them encourage contact with the chefs with bespoke culinary options. 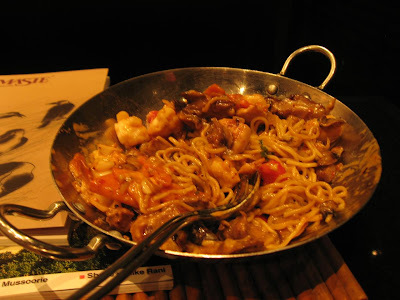 The Chinese kitchen features delicacies from Sichuan and Beijing provinces. The Mongolian Brazier facilitates the cuisine of the Mongols dating back to the days of Genghis Khan, whose soldiers grilled meats on their battle shields heated over charcoal. You can choose combinations of meats, seafood and vegetabls with seasoning and sauces. 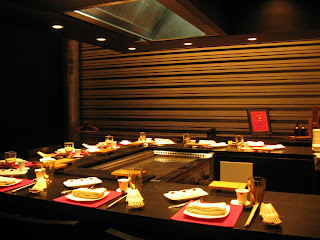 Then there is the Japanese Teppan Grill featuring Teppanyaki and the Korean Bar-be-que and Hot Pots with in-built grills in the tables. If that is not enough, there is a Japanese sushi and sashimi Bar. 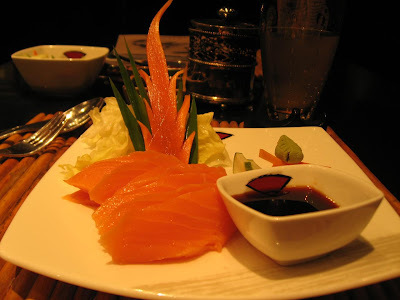 Tonight I began with a small plate of salmon sashimi and then followed with a Mongolian stir fry: fish, spring chicken, spring lamb, pork tenderloin, shitake mushrooms, bamboo shoots, carrots. Salad oil and the chef's condiments. Noodles. The sashimi seemed fresh and tasted pretty good. However, without Japanese chefs at the bar tonight, the cuts weren't the same calibre. Also, the wasabi wasn't the best - far less intense than the real thing. The Mongolian stir fry was excellent. Lots of seafood and meat and the right amount of spices and condiments. Completely filling too! For dessert, I tried the amazing jasmine tea creme brulee. Vanilla bean ice cream on the top. Bewitching! 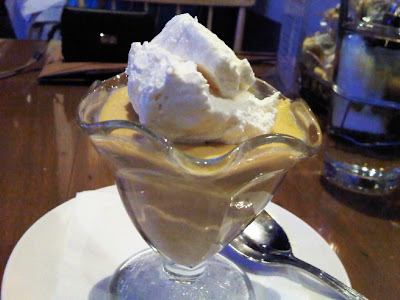 A thin layer of creme brulee with specs of carmalized topping and a large dollop of home-made ice-cream. 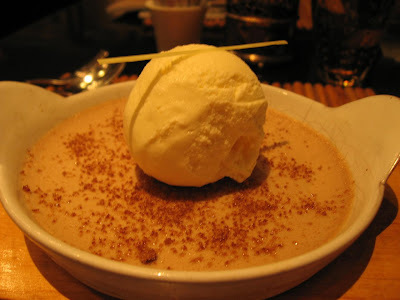 I strongly recommend this dessert to anyone who visits here. 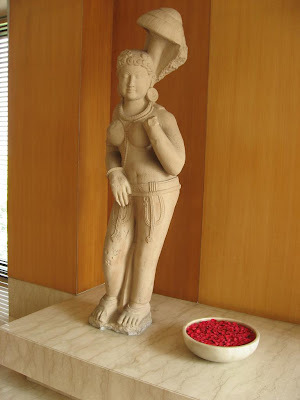 The restaurants at the ITC Sonar have some of the friendliest waitstaff, especially in their speciality restaurants. I also enjoyed some very Bengali selections during breakfasts such as Radhabollobi with Cholar Dal on one day, and Kochuri with Ghugni on another. Finally, the Kayakalp spa is luxuriously laid out across lotus ponds and swaying palms.